... check out our high quality latex leggings – you’re sure to find what you’re looking for. Our latex pants have a comfortable material thickness between 0.4 and 0.6mm, to ensure a perfect, tight fit while at the same time being compact enough, to meet everyday demands. Our pants often have belt loops, front and back pockets, or pockets at the sides. Many of our items are elaborately crafted with double seems, to ensure their longevity and high quality look. 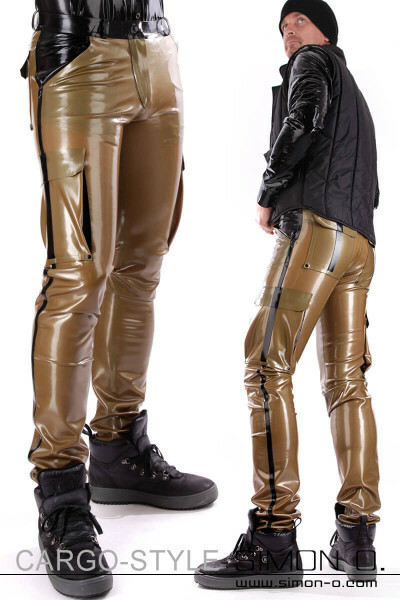 Latex pants are totally fit for everyday use when combined with casual, textile garments. Tight latex pants in a jeans design worn with a slim-fitting pullover with a V-neck make for an attractive outfit. Or how about wearing latex riding breeches at more exclusive occasions? Our latex riding breeches are particularly interesting for dominant men and guarantee for a very masculine and masterful appearance. 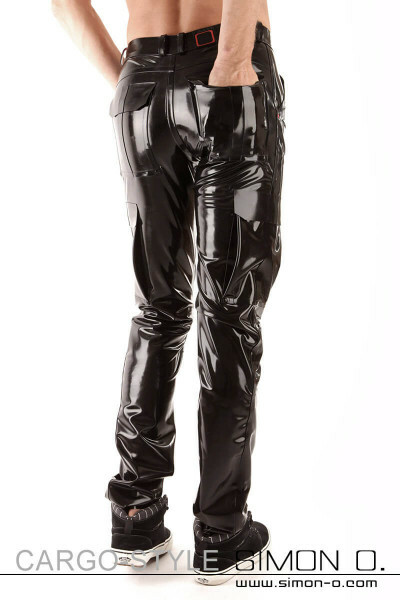 These high cut latex pants for men are made with full seat in a contrasting color. Belt loops, double-trimmed seams and faux pockets with deco-zippers ensure a high quality look. Combine your latex riding breeches with beautiful boots and a smooth polo shirt, to get a finished look from head to toe. If you’ve already got a catsuit in your wardrobe, you can combine it excellently to loose-fitting latex pants. You’ll get a new, useful combination that you can pull off layer after layer. On the other hand, loosely fitting pants conceal certain “trouble zones” that would get a little too accentuated in a catsuit. So if your shape isn’t as athletic as you would like: try out our latex jeans over a catsuit and you’ll be surprised by the “Adonis-effect”!